BJP massive rally in Kolkata addressed by Narendra Modi is signalling to a fact of eroding TMC grip in West Bengal. While attacking opposition parties, PM Modi toned up the concerns of tea garden workers and Gorkhaland (at Siliguri) and lambasted the development work done by Mamata Banerjee regime. 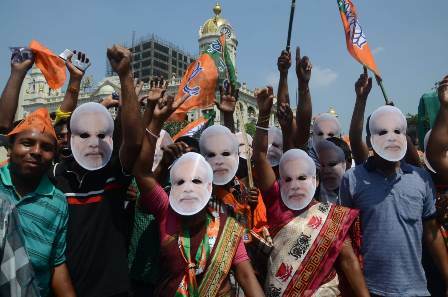 Kolkata, 3 April: The political temperature went high up by a few notches in Bengal as the Prime Minister Narendra Modi kicked off the campaign for the general polls by launching a blistering attack on the Opposition, particularly the TMC supremo Mamata Banerjee and described her as a ‘speed-breaker’to the development of the state and said her ‘boat is about to sink,’ a metaphor he used to predict the political end of TMC in Bengal. “Didi (Mamata Banerjee) is the biggest speed-breaker in thedevelopment of Bengal. She is not interested to work for the poor but she does politics of poor to keep herself in power. Several schemes launched by the central government for the poor have been stalled in Bengal because she doesn’t want the poor to get the benefit. The TMC and the Congress are the two sides of a same coin that has shown no willingness to remove poverty. She has not allowed the implementation of PM Kisan Samman Yojna under which a sum of Rs 6000 annually is transferred to the accounts of poor farmers and even the Ayushmaan Bharat health scheme was arbitrarily stopped by the state government,” he said while addressing the huge rally at Siliguri in North Bengal, the first of his two rallies in Bengal on Wednesday while the other was in Kolkata. With an aim to woo thousands of tea garden workers in Doars area and Darjeeling, the PM said, that he is fully aware of their problems and would solve it if he is re-voted. “I am fully aware of the problems faced by the tea garden workers and the apathy of the state government that has done nothing for them. I promise to look into these issues and come up with policies that would benefit the tea workers,” he said amidst the roaring chants of ‘Modi, Modi’ from the crowd. He also tried to attract the Gorkha voters apparently displeased with the BJP for not looking into their demands of a separate state and said that they would have no problem if the National Register of Citizens (NRC) is implemented in Bengal. The Prime Minister who was on his first visit to the state since the dates to the elections were declared took an indirect jibe at the Bengal chief minister and other leaders who had questioned the Balakot air-strike and said that they have become heroes in Pakistan. “There are some people who are raising questions on the air-strikes and are reeling under the pain whose wounds have been inflicted in the neighbouring country. They are seeking evidences of the strike and condemning the manner in which the terrorists have been treated. They have become heroes in Pakistan,” he saidwhile terming the general polls as a contest between an honest watchman and tainted opponents. The Congress President Rahul Gandhi on Tuesday (2 April) released his party’s manifesto where it has been mentioned that if the party is voted to power it would amend AFSA in order to strike a balance between the powers of security forces and the human rights of citizens and to remove immunity for enforced disappearance, sexual violence and torture. Modi also accused the Congress of playing into the hands of anti-national forces by removing TADA law and lacking willpower to retaliate when terrorists struck. The PM also urged the Bengal voters that time has come to get rid of the state government that has been in the grip of extortion and dynasty politics. “The state is the group of the dynasty rule of Bhua and Bhatija (referred to the CM Mamata Banerjee and his nephew and MP Abhishek Banerjee) who are looting the state. The extortion and other illegal activities are on a spree”, he said. 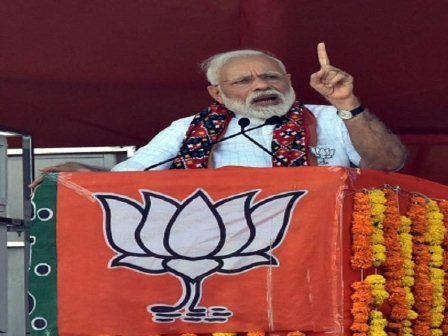 As part of his ‘mein bhi chowkidar’ campaign to blunt the ‘chowkidar chor hei,’rhetoric by the Congress, he asked the crowd to chant with him the slogan, “goan gaon mein chowkidar, khetkhalian mein chowkidar, ghar ghar mein chowkidar,”during the end of both his rallies at Siliguri and Kolkata. Senior BJP leaders Rahul Sinha and Babul Supriyo also took pot-shots at the TMC government and accused it of throttling the democracy in Bengal.